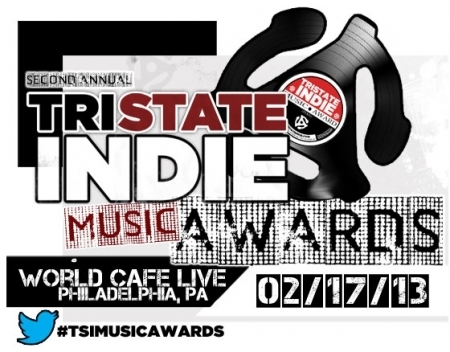 This Sunday, Tri State Indie will be putting on their 2nd Annual Awards show honoring the Best of Indie music from all over the area from World Cafe Live! in Philly. If you've wanted to attend a gala music awards show and walk the red carpet with the artists or you want to be one those who knows who's making the best new music, the TSI Awards is the place to be. Thirty awards will be given to the best and brightest in independent music in multiple genres ranging from rock, pop, folk, and hip-hop and including local, regional, emerging, and national level artists. All the acts were nominated by a committee of music industry insiders who work in radio, promotion, publishing, recording, booking, etc. The nominees were then voted on by the public to determine the winners. The show will also feature great performances by Nicos Gun, Levee Drivers, New Sweden, Sweet Leda, and Cold Fronts each playing a 30 minute set. There's also a FREE pre-party starting at 3pm Upstairs at WCL! Featuring performaces by Aaron Brown, The Lawsuits, Cheers Elephant, and Kuf Knotz. The pre-party also has free beer from Starr Hill Brewery and vitamin water. Tri State Indie is your local indie music source for what's happening in PA, NY, DE, MD, and NY. Tickets are available at the door or online. Doors are at 5pm, show at 6pm. 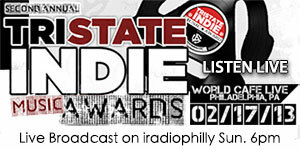 Now if you can't make it out to the Awards show, iradiophilly is going to be broadcasting the entire main ceremony LIVE! Just tune in online here or on our mobile apps for FREE and listen to the awards and the live performances starting just before 6 pm and going to 10:30pm!